Portarlington Credit Union is a community based credit union which helps serve the financial needs of the community and to its current 9,500 members. Portarlington needed an easy-to-use, modern website which was mobile friendly and easy to find among search engines which would replace their previous out dated website which was neither responsive or user-friendly. Our solution can be seen in the figure below. From various meetings and liasoning with our clients, we ascertained that one of the most important features to users is the ability to get quick access to the Loan Calculator and so this was placed in the header in a modern looking Call to Action guiding users to the calculator. The calculator was received via communication with the Irish League of Credit Unions after which we styled and customised to suit our clients interest rates & also ensured the calculator was mobile-friendly on all devices such as tablets and smartphones. The site also features a widescreen fully customisable mobile-friendly slider showcasing some of the services Portarlington Credit Union offer to it’s clients. It was also important that users were kept up to date with events at the credit union and so we featured both a view into the credit unions Facebook page along with the four most recent blog posts. 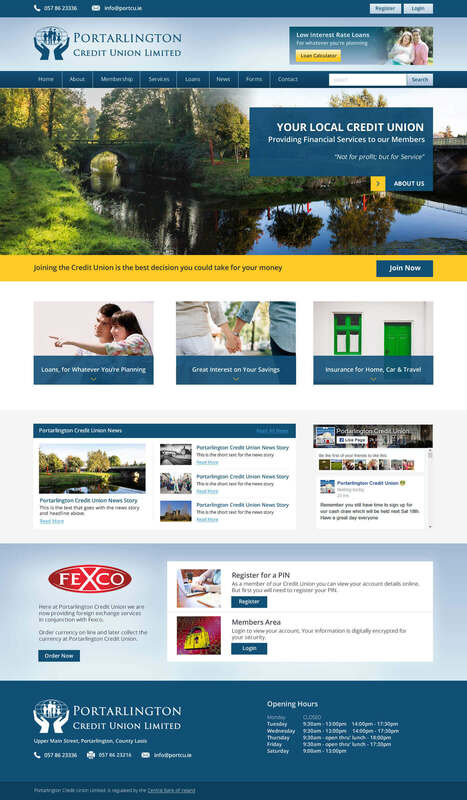 One of the main priorities of all of our sites is that they are optimised for the search engines and so a comprehensive approach was applied to Search Engine Optimisation to ensuring that all the relevant search terms would result in the Portarlington Credit Union website ranking high in the search engines. Content Management was very important on Portarlington like all our websites. Every piece of text can be managed and updated using our Content Management System.